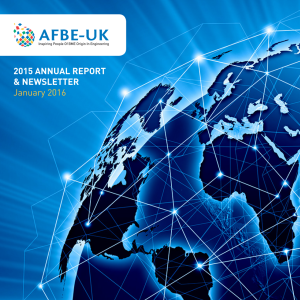 Blog AFBE-UK 2015 Report and Newsletter now OUT! AFBE-UK 2015 Report and Newsletter now OUT! The 2015 Report and Newsletter is now out. The newsletter includes articles written by our members in London and Scotland with something in it for everyone. Click here to view it. – Page 13: Time to Spread the Word by Yinka Bankole. – Page 09: NextGen programme by Jide Okwujiako. Check out the video. It also features an advert for the SPARK contest open to current and former students of Franco-British schools of higher education. Applications close on 8th February 2016. If you are a subscribed member of AFBE-UK Scotland, we are able to send you a free paper copy of this newsletter. Please email us via info@afbe.org.uk to order your copy.